A new trial at Sydney Water’s Bondi sewage pumping station will soon be storing renewable energy through the use of sodium-ion batteries, a cheaper alternative to the traditional lithium-ion batteries in use around the world. The Australian Renewable Energy Agency (ARENA) today joined with project participants to announce commissioning of the $10.6 million renewable energy generation system at the Bondi pumping station which features 6 kW of solar panels, an energy management system and a temporary lithium-ion battery pack. Sydney Water will use lithium-ion batteries for 12 months to test the energy management system before transitioning to sodium-ion batteries as the first batches of batteries are received from industry partners in China. The project has been led by energy storage researchers from the University of Wollongong (UOW) Institute for Superconducting and Electronic Materials (ISEM) in collaboration with Sydney Water and battery storage manufacturers in China. Sodium-ion batteries have been developed to be comparable in performance to marketplace alternatives, as well as being cheaper, modular and expandable. The Bondi pumping station was chosen due to the daily volume of wastewater it moves as well as proving the technology against highly intermittent and impulse-heavy loads. The system will generate approximately 8,000 kWh of energy each year – more than the Bondi pumping station requires to power its own needs. This pilot could be scaled up, as Sydney Water has a network of more than 780 sewage pumping stations. On behalf of the Australian Government, ARENA previously announced $2.7 million in funding for the Smart Sodium Storage Project which will develop and demonstrate sodium-ion batteries in renewable energy storage applications. “Thanks to the contribution of world-leading researchers from the University of Wollongong, these relatively inexpensive and reliable sodium-ion batteries aren’t too far off, potentially reducing our reliance on lithium. “We’re always excited to support significant R&D which shows promising commercialisation prospects as the novel sodium-ion technology will assist in the faster uptake of renewable and innovative storage solutions for Australia,” Mr Miller said. ISEM Director Professor Shi Xue Dou said the project was translating research outcomes into tangible impacts for society. “Sodium-ion batteries are a potential game-changer because the materials are much more abundant than those for traditional lithium-ion batteries, reducing the cost of the raw materials as well as reducing reliance on scarce, expensive lithium. “Critically, this project will deliver commercial-scale and ready-for-manufacture sodium-ion battery technology that allows lower-cost distributed renewable energy supply to become a reality.” Professor Dou said. The smart sodium storage solution project will be instrumental in developing the entire supply chain including the product design, development and manufacturing process. The approach of piggybacking on established lithium-ion manufacturing and production processes is also a clever way of not only overcoming the difficulties of such a new technology but the approach will assist in bringing forward sodium-ions demonstration and wider use for storage in Australia and the world. Remote communities from the Tiwi Islands to the South Australian border are set to be connected to solar power as construction begins on the next phase of the $59 million Solar Energy Transformation Program (SETuP) project. On behalf of the Australian Government, the Australian Renewable Energy Agency (ARENA) previously announced $31.5 million in funding towards SETuP, jointly funded by the Northern Territory (NT) Government and managed by Power and Water Corporation (PWC). Last year, Tranche One involved successfully integrating 3.325 MW of solar PV into diesel power systems in an initial 10 remote Indigenous communities. “This project will reduce the reliance on diesel which is costly and subject to price volatility, creates job opportunities in remote communities and provides renewable energy which can be expanded in the future. Each community will be operationally and technically ready to plug in more solar and storage as costs of renewable technologies fall. Over time, this could lead to very high percentage renewable power, driven by the lower cost of renewable energy,” he said. For a full list of the communities comprising Tranche Two, visit Power and Water. So it’s no wonder that many city residents have been seeking refuge in their swimming pools. But pool equipment is notoriously power-hungry, so a cool swim can come at a high price. Residential swimming pools consume three to five megawatts of power depending on their size, often making up 30-40 percent of total household energy consumption. To address this issue, ARENA has announced $2.5 million in funding for a pilot-scale demonstration in Sydney of an innovative technology that can slash the energy consumption of household swimming pools. The initiative is designed to cut usage by more than half, potentially saving pool owners an average of $1000 a year on bills, and reducing stress on the nation’s energy grid. Sydney homeowners who decide to join the program will have their pool upgraded to a ‘smart pool’ via the installation of an intelligent controller. This device is connected to the Internet of Things and automatically manages the pool’s pump and the dispensing of chemicals. The system is the brainchild of Sydney-based start-up Pooled Energy, which has invested some $15 million in its development. Pooled Energy’s cloud-based control system collects data from sensors that monitor the pool’s water chemistry and temperature. That is then used in conjunction with information on the local weather, the state of the national electricity grid, and the current cost of power to implement an optimal pool management regime without any inconvenience to users. Home owners pay an initial set-up fee to have the system installed and use Pooled Energy as their electricity retailer. The typical swimming pool’s energy consumption can be reduced by up to 50 to 70 percent, delivering a very attractive return on investment. A mobile app allows the homeowner to monitor the pool controller and override it if required, although this is rarely used, according to Pooled Energy, as the software handles the job so efficiently. Residential swimming pools often make up 30-40 percent of total household energy consumption. Pooled Energy sought ARENA’s assistance to accelerate its roll-out by jointly funding a $5 million pilot project that will enable it to increase the number of installed pool sites from the current 400, to between 3000 and 5000. The trial will also test the capability of Pooled Energy’s system to contribute to demand response during times of peak electricity consumption. Demand response reduces unplanned power outages and unwanted price spikes by rewarding users who can temporarily shift some electricity use to off-peak periods when extra capacity is required on the electricity network. Pooled Energy’s cloud-based network control system allows it to adjust energy use in response to signals from the Australian Energy Market Operator (AEMO) and networks. 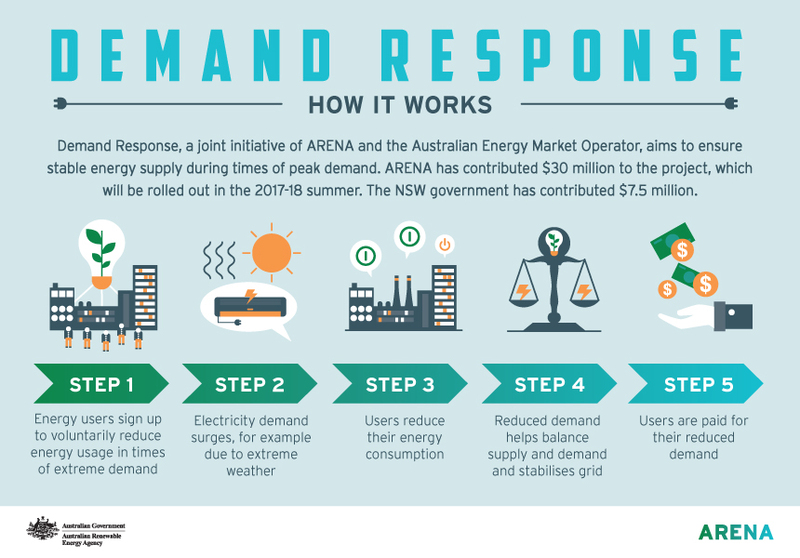 The Sydney pilot project forms part of a national demand response trial announced by ARENA and AEMO in 2017. This $35.7 million collaboration between the two agencies is designed to test proof-of-concept projects to support grid security and stability. While Sydneysiders will be the first to benefit from the new technology, Pooled Energy chairman John Riedl says the aim is to eventually expand the service nationwide. “There are more than 1.4 million swimming pools in Australia, and pools use approximately 10 per cent of the average demand on the residential grid,” said Riedl. “If all the pools were on at once, they would use up to 3.7 gigawatts of energy—the equivalent of two Liddell-sized power stations running at capacity—so there is huge potential to better manage that energy use for the wider benefit. ARENA CEO Ivor Frischknecht said the pilot project will demonstrate Pooled Energy’s ability to use swimming pools to manage demand at peak times. “Household swimming pools take up a very large load on the electricity network over the summer period and can contribute to increased power bills for families,” he said. Once the technology is proven in Australia, it has the potential to make a splash worldwide. Pooled Energy hopes to next export the system to the United States, where there are more than 12 million residential swimming pools. The Gullen solar farm has over 42,000 solar panels working hard and will produce approximately 22,000 megawatt-hours of clean renewable energy each year. This is enough energy to supply approximately 3,100 NSW homes. ARENA CEO Ivor Frischknecht said this was an important milestone for co-located renewable energy services in Australia. “Wind farm owners across Australia can look to Gullen and see the benefits of adding solar plants such as reducing the environmental impact, increasing their renewable energy output, and saving money on grid connection, approvals and site development costs by co-locating renewables.” Mr Frischknecht said. The Gullen solar farm was turned on and producing electricity last year, but was only officially opened this week. If you are struggling to imagine what 73 wind turbines and 42,000 solar panels look like, why not come and see for yourself? You can get up close and personal to a wind turbine and a solar array. Thankfully, this has been the focus of large sectors of Australia’s innovative energy sector, with tech firm EnerNoc set to launch a 20-megawatt demand-response initiative in New South Wales. Financed by ARENA and NSW Government, the ambitious and exciting project will provide a “virtual power plant’’ at a fraction of the cost of creating new supply of electricity in extreme weather conditions. This will be achieved by managing a ‘reserve’ of commercial and industrial businesses that agree to temporarily reduce or shift their power consumption, all in response to time-based rates or other forms of financial incentives. EnerNOC has already recruited 16 of the approximately 20 individual businesses that will be involved in the NSW project. Firms such as paper manufacturers, metalworkers and glass manufacturers will all take part. The reserve will be delivered entirely by load curtailment (i.e. not by diesel generation) and by companies that are not already participating in any form of demand response. ARENA is excited to lend a hand to this increasingly valuable resource option and its proven global use in quashing unplanned outages and smoothing unwanted price spikes. It gives consumers the opportunity to play a significant role in the operation of the electricity grid while earning incentives. At present, the demand response solution has not been fully adopted in Australia, while in many other countries, up to 15 percent of peak electricity is supplied by demand response. Boston-based EnerNOC is the largest demand response provider in the US, operating some of the most widespread demand response networks in the world, including California, Japan and Taiwan. Using sophisticated energy intelligence software and automated hardware installed on participating business’ premises, EnerNOC is shining a light on traditional grid consumption. The NSW reserve can be initiated remotely to respond within 10 minutes of a notification from the Australian Energy Market Operator (AEMO) that a spike in electricity demand is taking place–ensuring the public comfort during peak periods. Matt Grover, EnerNOC‘s manager of market development, says demand reductions can be achieved without significant disruption to participating businesses. “The loads involved in this program are pre-planned and are voluntarily curtailed for short periods of time,” says Grover. Additional to the NSW project, EnerNOC will provide another 30MW of demand response through similar projects in Victoria and South Australia, freeing up a total of 50MW to address surges in peak national electricity demand. 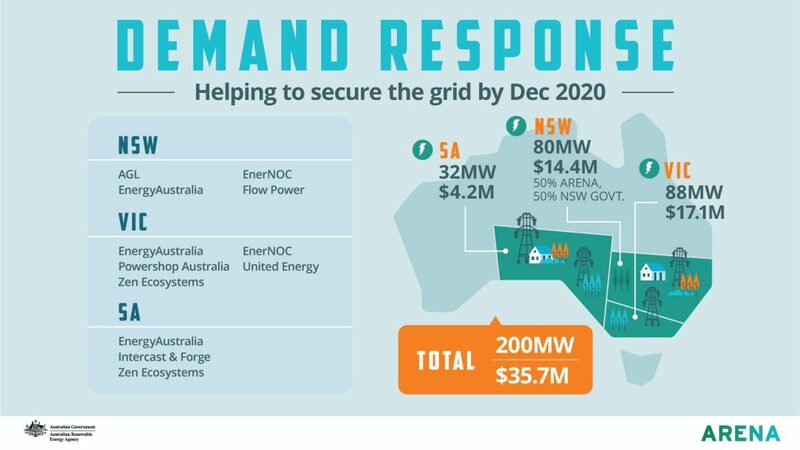 The projects form part of the national demand response trial announced by ARENA and AEMO in October 2017 to provide a total of 200MW of emergency reserves for summer blackouts and other extreme demand peaks by 2020. This $35.7 million collaboration between the two agencies is designed to test proof-of-concept projects to support grid security and stability. ARENA is committed to providing $28.6 million on behalf of the Australian Government, towards the initiative. $7.2 million of that is being matched by the NSW Government for NSW-based projects. Altogether 10 pilot projects have been awarded funding under the initiative. Apart from large-scale industrial and commercial businesses, these initiatives will also recruit thousands of households to voluntarily sign up to participate in demand response in return for incentives. Through this, household participants will have optional user overrides. ARENA CEO Ivor Frischknecht says the demand response scheme will explore various avenues to not only ease the strain on the electricity grid and prevent blackouts, but also to put money back into the pockets of Australian businesses and households. In turn, this will help to reduce energy costs and emissions—a win-win for all. “We are looking to test a range of technologies and approaches to deliver the most cost-effective outcome,” Mr Frischknecht says. Managing director and CEO of AEMO Audrey Zibelman says demand response has untapped potential to help satisfy demand during extreme peaks in Australia, just as it does in other countries. “These demand response projects will help manage spikes in peak demand in a cost-effective way using our existing electricity infrastructure and clever new technology,” Zibelman says. Australians love to talk about the weather, but don’t want to have to suffer because of it, and demand response projects like these are positive steps toward a stable and reliable energy future. It’s not a trick question but the answer might surprise: you build it elsewhere. For its newest Hybrid Energy Hub on Flinders Island, Hydro Tasmania tried something new. Parts were assembled in factories on the Tasmanian mainland and shipped over the Bass Strait in containers, ready for installation and commissioning within a matter of months. These “plug and play” components have been tasked a seemingly simple aim, to provide a reliable power supply to Flinders Island’s population of less than 1000 people. But there’s more than just lessening the number of blackouts at play here. Hydro Tasmania’s newest microgrid project aims to displace diesel generation on the island by 60 percent through solar and wind power and battery storage. On some days when the wind blows strong or the sun is out in force, it’s hoped the island will run entirely on renewables. It also builds on the work done in other remote locations at King Island, Rottnest Island and Coober Pedy by “modularising” the process of building such power systems in remote locations. “It’s something that’s not been done before,” Hydro Tasmania’s chairman Grant Every-Burns said. ARENA contributed $5.5 million to the project as part of its CARRE program for encouraging renewables in regional Australia. Chief executive Ivor Frischknecht said the agency was delighted to be involved in the latest iteration of Hydro Tasmania’s microgrid work. Speaking at the launch of the hub on Flinders Island on December 11, he said there was “huge potential” for the technology to be used in other remote communities in Australia and overseas. “Queensland alone has almost 50 remote communities that are quite similar in size and scale to Flinders Island,” he said. Hydro Tasmania’s manager of Hybrid Energy Operations, Ray Massie, agreed there were global applications for their work and data from the Organisation for Economic Co-operation and Development shows there is a need. It’s estimated that the more than 1 billion people still have limited or no access to reliable electricity, many of them in remote locations. The Flinders Island Hybrid Energy Hub features a single 900 kW wind turbine and 200 kW solar array. The enabling systems include a 750 kW/300 kWh battery, 850 kVA flywheel, and 1.5 MW dynamic resistor. The hub is on the site of an old diesel-powered plant and has been in operation since November. On the day of launch, it was headed towards 83 hours straight of 100 per cent renewable generation. LISTEN TO OUR PODCAST, THE INNOVATORS, EPISODE 6 FROM FLINDERS ISLAND. As a consumer, when you look at your monthly power bill, between 40 and 55 per cent of the total amount is made up of costs associated with the transmission and distribution network, according to the Australian Energy Market Commission. And as the infrastructure in our cities and major markets ages that price is likely to increase. Researchers at the University of Technology Sydney, led by Dr Chris Dunstan have argued that the current regulatory framework means that building new grid infrastructure is often more profitable for network businesses than introducing demand management solutions that encourage people to use less energy, even when doing so would reduce costs to consumers. The ARENA-funded research from Dr Dunstan’s team has been instrumental in bringing about a change to market rules that will come into effect in 2019 and should encourage the use of demand management when it is the most suitable option. But a new project being funded by the Australian Renewable Energy Agency (ARENA) aims to demonstrate, ahead of those changes, a real-life implementation of that approach by fast-tracking the integration of rooftop solar and battery storage with the broader electricity market. And a handful of Melbourne residents will be the guinea pigs leading the charge. ARENA is providing $450,000 for United Energy to trial behind-the-meter residential solar and storage in Melbourne this summer. The $1.23 million trial will demonstrate if harnessing the capability of residential solar and storage systems can defer the need for costly upgrades to the distribution network, leading to a better deal for consumers. ARENA chief executive Ivor Frischknecht said that solar and storage technology could reduce the need to build new grid infrastructure. “This trial will show how solar and storage could play a key role in future energy infrastructure, easing pressure on the distribution network and reducing network costs for consumers,” Mr Frischknecht said. United Energy will install 4kW of solar and battery storage systems in 42 households across seven of the most constrained substations across United Energy’s network in Melbourne’s south eastern suburbs and the Mornington Peninsula. These are substations where the ability to meet demand is most difficult to manage. The systems will provide 4kW solar/13.2 kWh storage per site, creating 160kW solar and 554 kWh storage in total. At times of peak demand, when the substation is struggling to deliver the amount of electricity required, homes participating in the trial will automatically switch from receiving electricity from the grid to receiving it from their battery. That should remove load from the substation and allow a greater balance between supply and demand, making for a more stable network. While the ability of solar-linked battery storage to play this role should be relatively clearcut, network operators need to learn how such a system would work, get used to working with it and develop confidence that it can play a larger role in the future. This trial will provide an opportunity to demonstrate that ability to meet network reliability requirements and help network operators to increase efficiency and reduce costs. United Energy’s Network Planning and Strategy Manager Rodney Bray said solar and battery storage technology would change the way utilities plan their grid infrastructure. “As battery prices fall in the future, solar coupled with storage has the potential to become an economically feasible alternative to traditional, costly network augmentation,” he said. broad range of development, demonstration and pre-commercial deployment projects that can deliver affordable and reliable renewable energy for Australian families and businesses. The UTS review found that incentives were needed in order to encourage network operators to look for demand side savings.The partnership between ARENA and United Energy is a practical example of a sustainable solution to maintain network reliability while reducing the need to invest in expensive new infrastructure. And that huge penetration has thrown up both challenges and opportunities. It means that Australian companies are well placed to take advantage of this moment with smart products and new technology born from creative R&D. One such company making a splash with innovative thinking is Queensland-based Redback Technologies – a fast-growing start-up that has set as its goal helping to ensure that Australian households and businesses are one day entirely powered by renewables. At ARENA WIRE we love celebrating the success of Australian companies who are leading the innovation push that is helping accelerate the shift to a renewable energy future. Redback creates products that seamlessly integrate hardware and software to help consumers optimise the generation, management and storage of their own power. “Our smart software uses machine learning to predict solar generation and customer usage, using inputs like weather data, and then makes intelligent decisions on how to use energy to achieve the best outcome for customers,” Redback founder and Managing Director Philip Livingston says. The company’s flagship product, the Smart Hybrid System, consists of a 4.6kW inverter and battery enclosure which integrates with up to 9.6kWh’s of energy storage. The system is enabled to provide an uninterrupted power supply and backup power all in one. It uses machine learning to gather intelligence over time, learning from user habits as well as drawing data from external factors like weather to control energy use. The Redback system also allows consumers to take charge of their energy usage. Solar panels generate their energy in the middle of the day but, for most people, peak consumption is before work in the morning and after work in the evening. The system enables households to direct the energy generated in the middle of the day to their devices using a cloud-enabled intelligent system for analytics and remote control. Redback’s system optimises self-consumption of solar-generated electricity so households can use their energy when they want – improving the pay-back from solar panels. It works to drive down energy costs for households that install the technology. 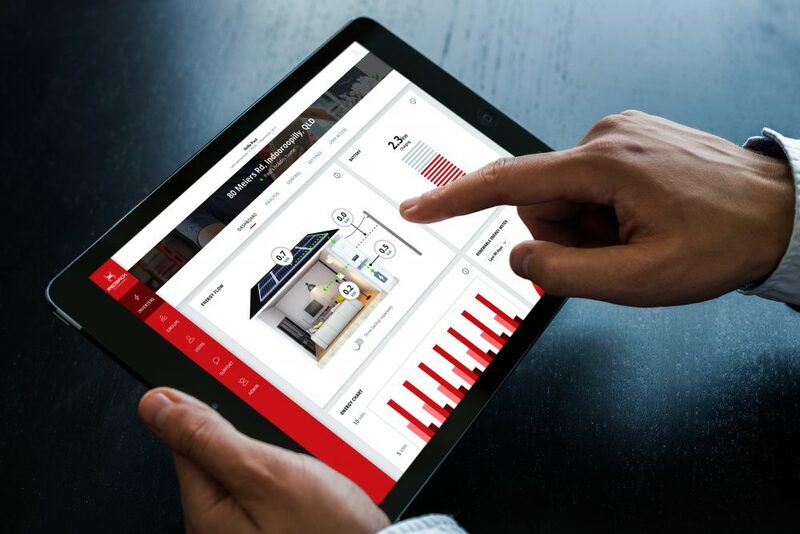 Redback allows householders to optimise their solar and battery systems. IMAGE: Redback. Redback’s software also enables thousands of systems to be aggregated to form a virtual power plant to provide grid services, demand response and to support the increased integration of renewables into the grid. The devices will form a part of EnergyAustralia’s demand response project as part of ARENA and AEMO’s three-year $35.7 million demand response trial, which will be in place for the coming summer. Redback has enjoyed a meteoric rise and the company is preparing to expand further, announcing plans to take on an additional 30 staff over the next six months as it beefs up its research and development capability. 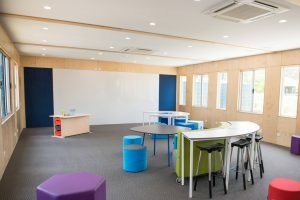 That expansion has been made possible by an equity investment of $US 7 million from The Clean Energy Innovation Fund and Right Click Capital, which was announced last month. The Innovation Fund draws on the combined skills and experience of the Clean Energy Finance Corporation (CEFC) and ARENA. The fund – which uses finance from the CEFC to invest in innovative clean energy companies and projects – recently committed US$5 million (approximately A$6.42 million) to Redback. Right Click Capital, an investment firm specialising in identifying, investing in and supporting high-growth Internet and technology businesses across Australia, New Zealand and South East Asia, has invested about $2.55 million. The firm will also contribute its specialist experience to support Redback’s expansion in Australia and the wider Asia-Pacific region. Mr Livingston says the equity investment will allow the company to expand its research and development capabilities as well as accelerate development of its smart software suite. “Redback is committed to innovation. Our vision is to ensure Australian households and businesses are entirely powered by renewables,” Mr Livingston said. ARENA Chief Executive Ivor Frischknecht said the investment announced last month was a positive move for the innovation fund. “We’re proud to get behind Australian innovation that helps Australian households and businesses make better use of their rooftop solar and battery storage, improve efficiency and save on energy costs,” he said. Those comments were echoed by CEFC Chief Executive Ian Learmonth. “We can lead the way in developing innovative technologies like Redback’s so households and businesses get the most benefit from these investments,” he said. The investment follows EnergyAustralia’s recent announcement that it will offer Redback’s inverter system to its 1.7 million customers in Victoria, New South Wales, Queensland, the ACT and South Australia.